Simple and elegant, tri-fold programs of white paper offer plenty of room for your ceremony and bridal party information. The front is printed with your choice of design at the top. In addition to shipping please allow 5-7 business days for production. Personalization Options: Your choice of ink color, desgin, fonts and wording. The paper is thin. The ink was not the color I chose. The center alignment of the font was not centered. I e-mailed customer service two days ago and have had no response. I'm really unhappy, as they don't look professional at all. Loved the finished product ! I ordered these to use as Programs for my daughters wedding. We loved them, but had to reorder as the light ink color was very difficult to read. I did the order over just changing to a darker ink and they were great. If there would be some way for you to advise future customers about the lighter ink colors being harder to read on the smaller typesets that would be so helpful. I had good help with this issue from your staff and my replacement order was sold to me at half price, which I very much appreciated, but it was deceiving looking on the computer at the preview sent to me as to how difficult that lighter color in the smaller print was going to be to read. If I would have been advised about this possibility before I placed my order I would have chosen a darker ink the first time around. It would have saved me time, money and disappointment. We were very pleased with the second order. After ordering my wedding programs, the proof took over 3 weeks before receiving one after I sent an email regarding the delay. After that we got the proof however it was another week and half before we were to receive them. I have ordered from other sites for invitations and announcements and they always arrived on or even before the day that was expected. Invitations by Dawn had me waiting and even going out of my way to pick them up to get them on time. I will never use this site again. I paid extra for the "three-day delivery" because I was cutting it close for my event. I did not think it would take so long to actually print and ship the order. From there it took three days (which isn't that much quicker than standard shipping) and we got them one day before the event. I was a little panicked. I loved how they came out for my own wedding. I definitely love the products that I received. This program fit perfectly in my theme. It was really easy to design and make sure it is perfect. The whole process was easy and perfect to get the exact product you want as a bride. The Wedding Programs I ordered were very nice. Although I had specifically written in thespecial notes portion at the bottom of my order to do the programs exactly like the sample Ireceived in the mail. The design on the front of mine was much smaller in size than the sample so I wasn't happy with that. Otherwise, the programs were wonderful! We ordered our wedding programs from Invitations by Dawn. They exceeded our expectations. They had so many options for the design and you could save and go back at a later time. We looked at so many wedding websites and these programs looked beautiful and were priced reasonably. They even expedited my shipping at no extra cost to ensure delivery in time for the wedding. I only wished that I had found this website before we ordered our invitations for the wedding. The customer service was exceptional when making changes after viewing the proof. NICE BUT NEEDED THE OPTION TO USE MORE.. 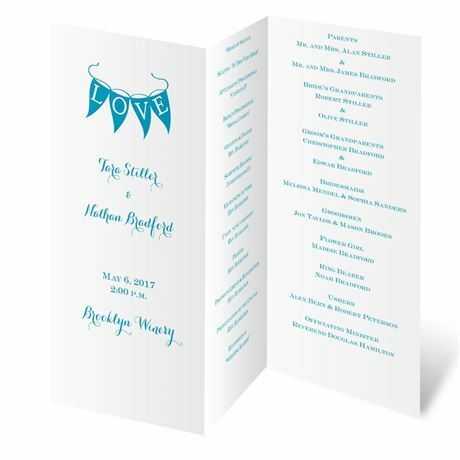 This programs where nice, but could not use the entire space there where a lot of space in the back that could have been useful, also the options of the amount to buy no less than a hundred may need to change seeing that some one may just be having a small wedding, the printing was GREAT LOVE IT!!!! !